Choosing new appliances can be nerve-racking! There are so many options to choose from, each one promising a feature better than the previous one. We just went through the ordeal of choosing appliances for our new custom IKEA kitchen renovation. After a lot of research and comparison we finally chose which appliances would be the best fit for our family. After much research and a subscription to Consumer Reports, we finally chose this range. This GE range wasn’t the top rated range, but certainly wasn’t the least rated either. After taking price into consideration as well, we thought this GE Profile range was the best bang for our buck. We also took features into consideration. I was adamant on a few key features; it had to be: gas, double ovens, and no controls or a panel along the back that sticks up. I love having a double oven because you can cook two different meals at the same time. Also, if we only need to cook one thing we can just heat up the smaller oven which is quicker and doesn’t get the house as hot. If you have small kids you might want to rethink this range though as all the knobs and buttons are right in front. We chose this GE microwave for the sole fact that it matches the range. With them so close together it was important to me that they match and are a set. The microwave has been great. We haven’t had any issues with it. It has a 30-second and a 1-minute button which is great. It’s so new-age looking that guests can’t figure out how to open it (the door is on the side and the entire front panel opens). There are a ton of little food buttons on it but I never use them. I’m sure they are useful though.) When the door swings open, it does not hit the hardware on the cabinets. It doesn’t even come close to hitting it. We love this dishwasher. LOVE. Love isn’t even a strong enough word for my feelings about this dishwasher. We bought this same exact dishwasher in our previous house. 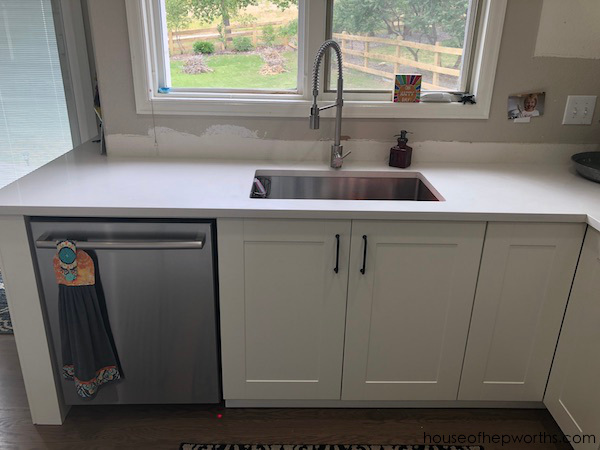 As soon as we moved into this house, well before any renovations started, we purchased the same exact dishwasher and installed it. This dishwasher is quiet. It cleans VERY well. It’s easy to load. It has a mini secret drawer on top for small items that would get lost on the bottom otherwise. Plus it just looks good. While it’s running, it is so quiet that we don’t know it’s on. A small red dot appears on our floor to signal that it’s in use and to not open it. When the light goes off, the dishes are done. I also love that the control panel is on top, hidden. It makes the dishwasher look cleaner and less busy. Be still my heart for this refrigerator. We’ve used it for 6 months and have no complaints about it whatsoever. We LOVE LG fridges and have had a few in our lifetime. Until LG gives me a reason to not love their fridges anymore, we will continue to purchase them and sing their praises. 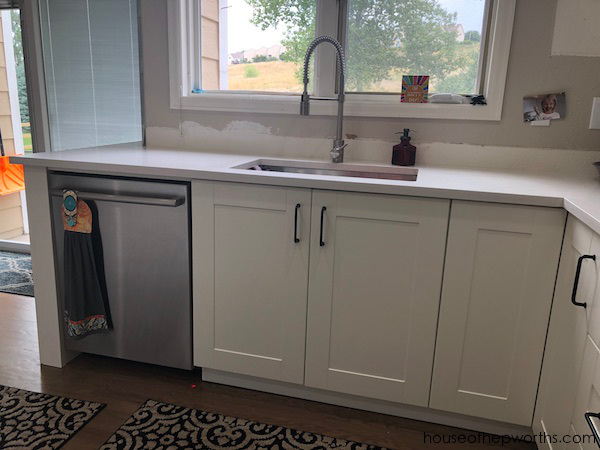 We purchased the counter-depth fridge to keep the walkway clear and more streamlined. Because of this, it is shallow inside. It definitely does not hold as much food as a standard size fridge. We moved our last LG fridge to our garage though so we have a nice overflow and drink fridge out there. I really wanted one with french doors on the top and bottom. Yup, the freezer has french doors and drawers inside that you pull out. With my big drawer in our last fridge, I felt like food got lost in there and it was hard to keep organized. This french door fridge may not be everyone’s cup of tea, but I LOVE it. It also has an in-door water and ice dispenser. I was hesitant because the ice tray is small, but honestly, we have never run out of ice. Also, I’m drinking a lot more water now because it’s so easy and accessible. I really am digging our “springy” faucet. I love the industrial vibe it gives our kitchen. I love that it’s so high up that I can wash big pots and pans easily without it getting in the way. It is so versatile and functional. I would hands-down buy this again and again. So far we haven’t had any issues and have been very happy with it. Ah, the sink. I saved the best for last? 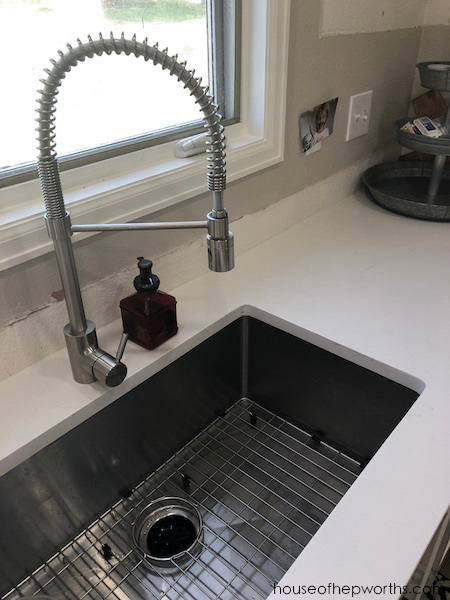 I know I keep saying “I live this” and “I love that”, but honestly, truly, I love this sink. 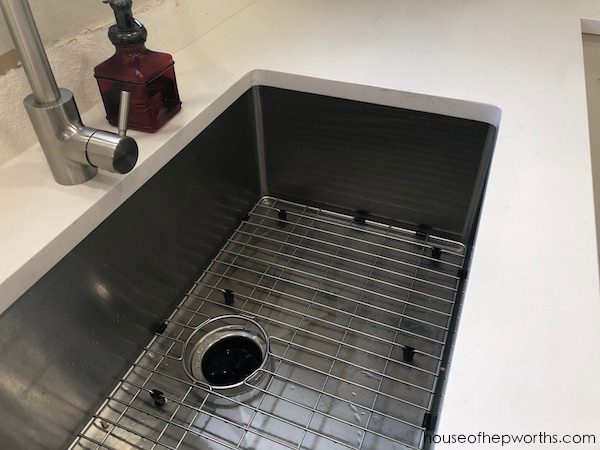 I put this exact same sink in my last house and was so smitten that I bought it again and installed it in our new house. I adore it that much. Some people prefer a double bowl. I get it. I am not one of those people. I LOVE that this sink is so big I can wash a large jelly roll pan with wiggle room. If I had babies, I’d be bathing them in this sink every day. It holds a ton and even when it’s full of dishes, it’s so deep that no one can see them! Once we chose our appliances we searched the internet and found the best price on each one. Surprisingly, Best Buy is generally our go-to place for choosing appliances. We have gotten more great deals there than anywhere else. There you go, folks. 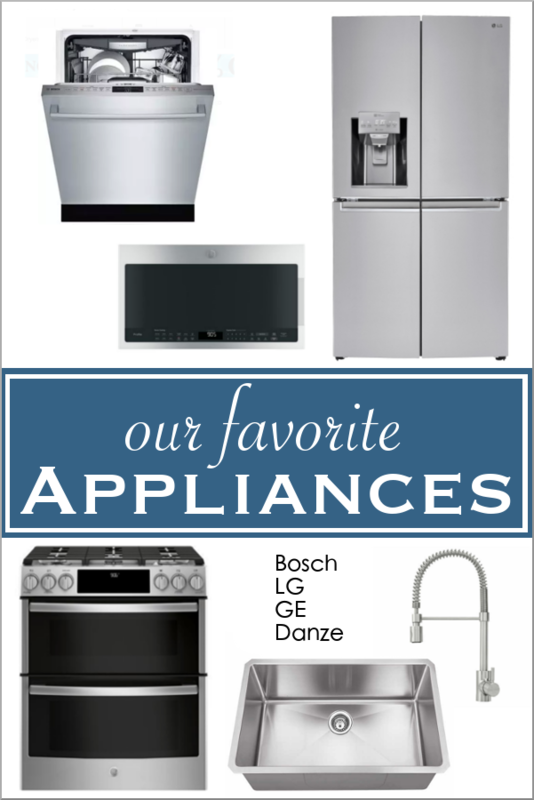 All of our appliances and how we chose them. These appliances are perfect for our family. Your family might choose appliances to meet other needs. 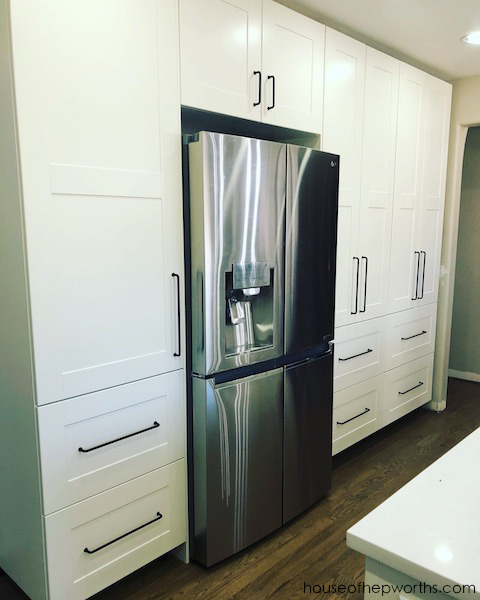 The bottom line is, when purchasing your appliances, do your research, compare models and prices, and choose one that will hopefully last for years and years. 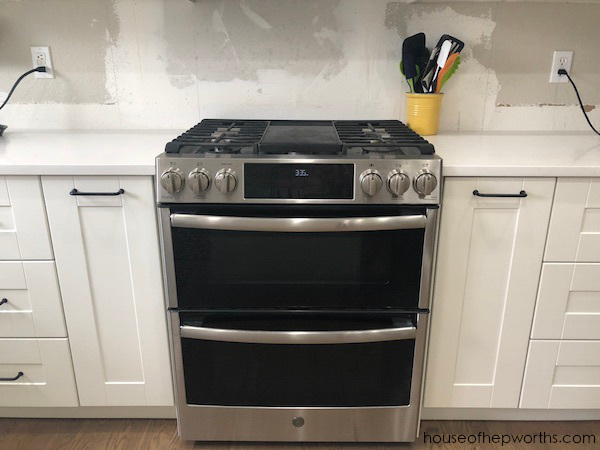 Here are all the appliances we chose for our previous house renovation. 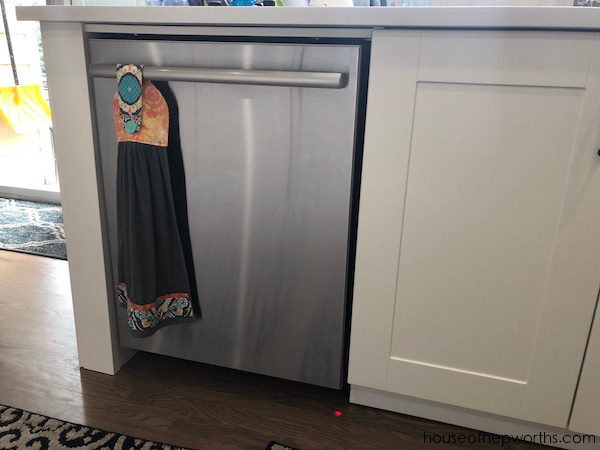 Great list….I needed this we are looking into replacing several of our appliances. I love the refrigerator so much better to see frozen foods. 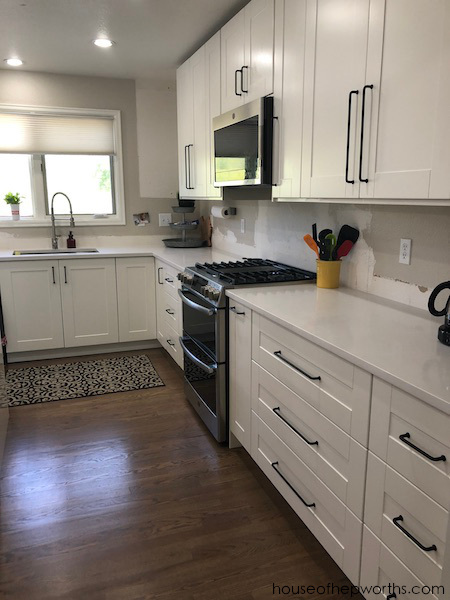 Enjoy your wonderful updated kitchen. Monica, thanks for your comment! We love this refrigerator! I can see everything in the freezer now. Be aware though, the counter depth ones feel much smaller! Linda, yes, we can fit a frozen pizza box in the freezer. Yes, the freezer is one continuous space. Each door side is not a separate freezer. As for the Bosch dishwasher – yes, ours has a heated dry feature. Our dishes always come out hot and dry. We were looking at that fridge just last week. 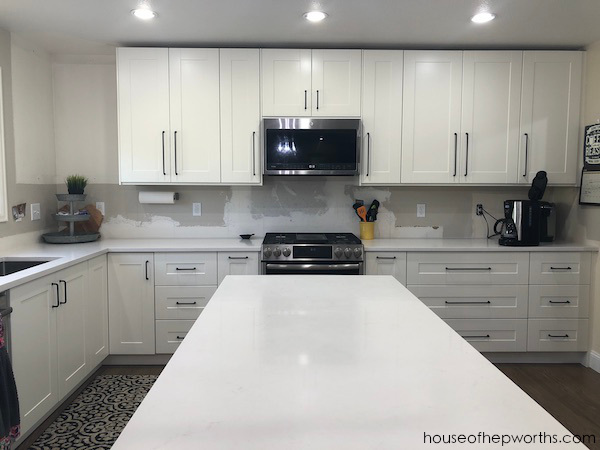 It’s exciting to remodel a kitchen- we did ours 10 years ago. We almost went with IKEA cabinets but decided against it because every bed/drawer/bookcase item we’ve bought from IKEA always comes apart- cams come loose, drawer bottoms can’t carry the load, etc. I hope your beautiful kitchen makes you happy! Love the white!! 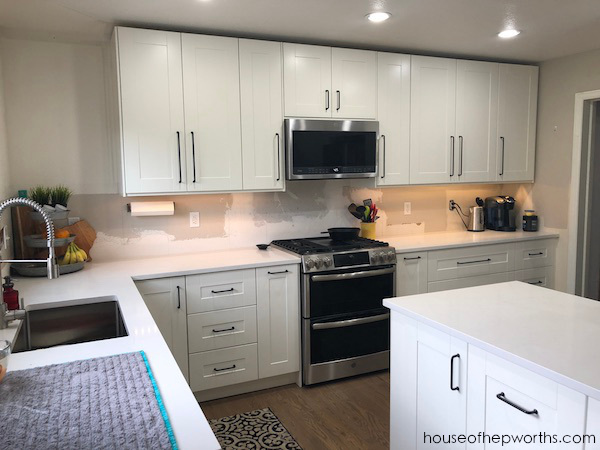 We were concerned about the quality of the cabinets, but all the reviews of the kitchens are good so we took our chances. 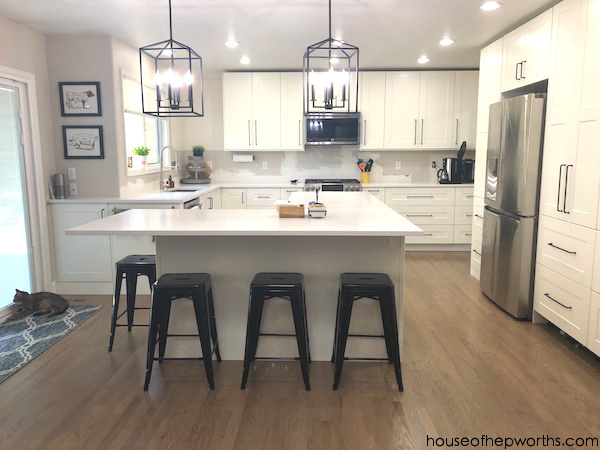 I think IKEA tends to be a kitchen cabinet company that makes other stuff as well (my opinion) so they seem to really focus on quality of cabinets. Plus, once the boxes are installed they never get moved or drug around the house. Hopefully that will help them stay good and secure too. It is definitely a concern though and I can see your point. Good luck with your renovation!! Hi, Great list…This is actually what I am looking for this. We are looking into replacing several of our appliances. I love the refrigerator so much better to see frozen foods. 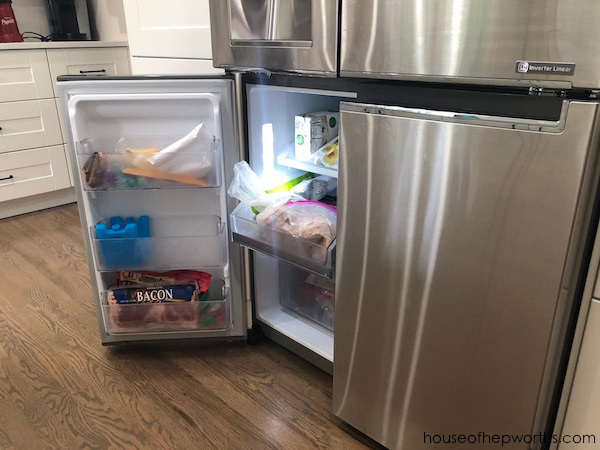 Can you tell me what the size of your fridge is? 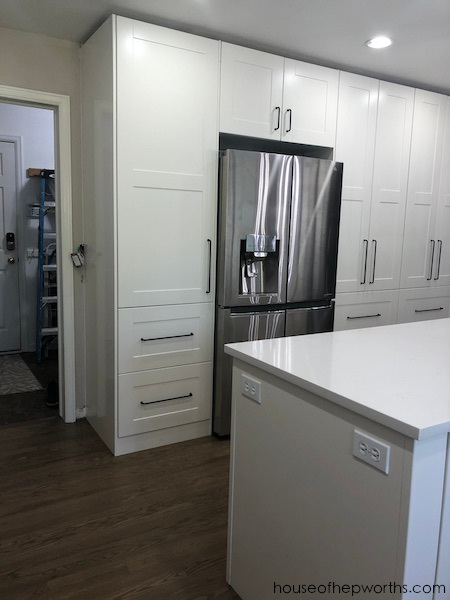 Enjoy your wonderful updated kitchen. Thank for your informative article. Our fridge is the counter depth one. If you click the link you can see all the specs. Very nice. I have a bunch of appliances that I keep telling my husband are about to kick the bucket. I know they’re all going to go at once too, haha! I really like LG refrigerators too, so thanks for backing me up. Absolutely! We have loved all our LG products so far.